Pictured here is my friend who caught this halibut last week. . . he needed help landing it, as it overwhelmed him and the boat. It cut the day of fishing short, as there was no room for anything else in the boat. . . taking it back to shore, no scales to weigh it, but it was estimated to be 400 lbs. Kenai Peninsula is about a 4 hour drive from Anchorage, and most charters guarantee you a fish or two, like in the background, but not like this!!! Our weather has not been cooperating in the morning, but by mid-day, the sun seems to find it's way, and baseball prevails in our six week season. I am speaking of the Alaska Baseball League, but August follows with the American Legion games. Every weekend bring another bike rally or fun run, and the turnout is pretty heavy for all of them. It's become a great fund raiser for npo's and the Anchorge Bucs joined this method with success just last week, with the start of the 6k run from Mulcahy Field (our ball park). Fourth Avenue is the main street of Anchorage, and tourists are filling up the too-narrow sidewalks daily. Most highlights are within walking distance of the Visitor Center, but there are free shuttles to the further venus, ie. Sourdough Mining Company (that's a restaurant) and the Heritage Center. This latter site has a very complete setup for the visitor to view all the Native tribes, as they've built a pond where you can walk around the circle and view huts and Eskimos doing crafts, wearing native dress, etc. Drumming is performed in the main hall, with different groups. My way to remember the names of the main tribes is the name of a former downtown store called Taheta, which is an acronym for Tlinket, Athabascan, Eskimo, Tenana, and Aleut. As you journey out of Anchorage, you have a limited choice, as there are two main highways . . . one to exit on the Glenn Highway, and the second to head south on the Seward Highway. The Glenn Highway takes you to Mt. McKinley in Denali National Park and on to Fairbanks, or you can continue to Tok, and then to and thru Canada to the other part of USA. The Seward Highway takes you to Seward, obviously, or to Homer, which is the "End of the Road". The Alaska Railroad goes to both Fairbanks, and Seward, but the latter is perhaps my preference, as it doesn't follow the road, but takes you into the back country to see Spencer Glacier and other beautiful sights. So anyhow, I surely hope I haven't bored you with all this, but I can only assume the reader is not familiar with "My Alaska." Signing off for now. These are the beautiful days of summer, with daylight until almost midnight, and our 'crops' growing pretty swiftly. Personally, we have about 6 tomato plants with blossoms on them, so you'll see a happy gal here when we get to pick some tasty red babies. Tourists abound, and Fourth Avenue is tee-shirt row once again. The bars and restaurants are doing a great business, and this summer, for the first time in several years, we have cruise ships arriving at the Port of Anchorage, within a mile of town. Altho' I still don't go sleeveless, many locals do, and even jump in Goose Lake for a swim, but let's say the golf courses satisfy my appetite for outdoor activity. (I bike to an indoor pool at a high school nearby.) Our short baseball season is in full swing, and the Anchorage Bucs have two losses already in the Alaska Baseball League. Things will get better, as the players are still arriving from the lower states. We're hosting a relief pitcher, who is a Brett Favre look-alike. Fishing season had a dubious start, because catch-and-release was the rule until today. Now anglers can keep king salmon less than 46 inches or more than 55 inches. The Women's Run for Breast Cancer over the weekend drew over 7,000 runners and raised a health amount for the cause. I think it was over $100,000, if I remember what I read. Nope, I didn't run, or walk either. Slacker! Sorry I'm not posting a picture on this quickie blog, but I have a new program on my computer and I can't seem to save images to a file . .. just print them. Guess I should take some time on my learning curve. With the beautiful weather we've been having in Anchorage, it's easy to see why we will never leave our home state. 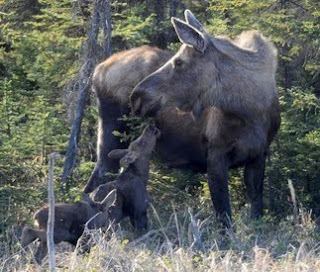 This is the time of year when moose are birthing on our front lawns, and munching on the beautiful flowers and fauna. Also, baseball starts it's short season on the 6th. This year we have a quality field to compare with the major leagues. The American Legion sponsored this construction, which you can read about here. You can also read about the players and see the schedule for the Anchorage Bucs here. Other outdoor activities include marathons and bike races, 5 and 10k charity walks, and farmer's markets on several locations. Recently, our famous Chilkoot Charlie's owners has donated his big parking lot for the Spenard Farmers Market, and it's been growing over the last few weeks. Indoor activities are not left behind, and while the movies are not attracting their winter crowds, the restaurants are full up. This is mostly with the large tourist influx. We also had our first cruise ship arrive right downtown (1 mile north) for the first time in 25 yrs., with more sailings to come. Anchorage is large enough to absorb a few thousand extra bodies on the street. Fourth Avenue has become a Tee-Shirt and Sandals Row, hardly leaving room for the vagrants who have moved further east. This is my own observation, of course. So it's time to cut my blog short, and hasten for a bike ride . . . check back.